This book will make you think! Chef Dan Barber has written an informative and intriguing book on his quest and vision for the future of American cuisine, what he calls the "third plate." With the perspective of a chef, Barber travels to different parts of the world and draws upon the wisdom of chefs and farming communities who are doing radical things to make a more healthy and sustainable future. What is the "third plate"? Read and find out! Today’s optimistic farm-to-table food culture has a dark secret: the local food movement has failed to change how we eat. It has also offered a false promise for the future of food. In his visionary New York Times–bestselling book, chef Dan Barber, recently showcased on Netflix’s Chef’s Table, offers a radical new way of thinking about food that will heal the land and taste good, too. 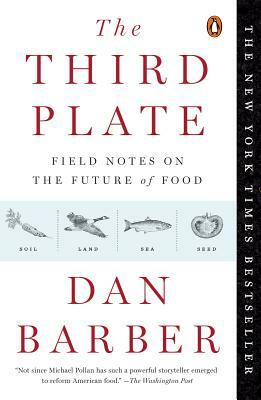 Looking to the detrimental cooking of our past, and the misguided dining of our present, Barber points to a future “third plate”: a new form of American eating where good farming and good food intersect. Barber’s The Third Plate charts a bright path forward for eaters and chefs alike, daring everyone to imagine a future for our national cuisine that is as sustainable as it is delicious. Dan Barber, who was recently showcased on Netflix's Chef's Table, is the executive chef of Blue Hill, a restaurant in Manhattan’s West Village, and Blue Hill at Stone Barns, located within the nonprofit farm Stone Barns Center for Food & Agriculture. He lives in New York City. "Not since Michael Pollan has such a powerful storyteller emerged to reform American food.... Barber is helping to write a recipe for the sustainable production of gratifying food." "Each grain represents an agricultural virtue: Rye, for example, builds carbon in the soil. Taken together, they argue for a new way of thinking about the production and consumption of food, a 'whole farm' approach that Mr. Barber explores, eloquently and zestfully, in The Third Plate: Field Notes on the Future of Food... Mr. Barber’s subjects tend to be colorfully eccentric and good talkers, capable of philosophizing by the yard. To put their efforts in context, Mr. Barber unobtrusively weaves in a hefty amount of science and food history. Readers will put the book down having learned quite a bit... Mr. Barber is a stylish writer and a funny one, too." "Dan Barber is not only a great chef, he's also a fine writer. His vision of a new food system—based on diversity, complexity, and a reverence for nature—isn't utopian. It's essential." "After my first meal at Blue Hill, I paid Dan the ultimate farmer compliment. I told him that he made vegetables taste almost fresher after he had prepared them than when the farmer harvested them. Now I am equally impressed with his writing. Food has stories and Dan tells the stories as well as he cooks. If you want to know about food, read this book." “Dan Barber writes with the restrained lushness with which he cooks. In elegant prose, he argues persuasively that eating is our most profound engagement with the non-human world. How we eat makes us who we are and makes the environment what it is. It all needs to change, and Barber has written a provocative manifesto that balances brave originality and meticulous research. His food is farm-to-table; his eloquent, impassioned book is farm-to-heart."